The information provided here has come from a special Healthy Water Report from the Wellness® Company. "We have been told to drink at least eight glasses of water every day. This report will highlight why that could be the WORST thing we can do!" For almost 100 years, chlorine has been added to disinfect our municipal water supply. The level of chlorine in your area depends on the quality of your water supply, but even if there's no noticeable taste or smell, the chlorine is present, as are the by-products of chlorination, which include some of the most potent carcinogens known to man. Research conducted jointly at Harvard University and the Medical College of Wisconsin indicated that drinking chlorinated water may be linked with an increased incidence of bladder and rectal cancers. your condition could be worsened by drinking chlorinated water. Chlorine reacts with the organic matter already present in water (humus, the organic material formed from plant decay), toxic by-products can form. Chloroform, for example, causes cells to mutate and cholesterol to oxidise. Once used as an anaesthetic, chloroform was banned in the US in 1976 when it was discovered to cause cancer. Another by-product, Mutagen X, is considered the 'single largest contributor' to the mutagenic potential (the ability of a substance to cause genetic mutations) of our municipal water supply, according to the US Emvironmental Protection Agency. 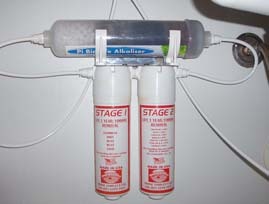 MX has shown up in every chlorinated water source for which it has been tested. Testing indicates that DCA, another mutagen, alters cholesterol and possibly causes liver cancer in laboratory animals. Can you honestly say that your body is better off for having tap water put in it every day? Of course you can't. Just a moment's thought will convince you that your body and brain cells will be better off without bleach and all these chemicals getting into them. However, this is just one of the known dangers in tap water. Tri-Halomethanes are by-products formed when Chlorine comes into contact with organic matter mentioned before. The problem with Tri-Halomethanes is that they are far more carcinogenic than chlorine. In fact, scientists believe they are responsible for more cancers than chlorine due to their massively increased carcinogenic potential. Water and health authorities are only concerned about the water that comes out of your tap. They don't care what happens afterwards. Their interest in your safety stops at the faucet. The problem is Tri-Halomethane formation after it leaves your tap. Remember we told you that Tri-Halomethanes are formed when Chlorine combines with organic matter. What happens when you drink or cook with water that has Chlorine in it? Tri-Halomethanes are formed right there in your stomach and in the water of the food you are preparing. Those healthy veggies and other foods are literally boiling in a chemical stew. That isn't what you want at all. Obviously the only way to ensure protection against Chlorine and all its by-products is to install a high quality filter that is guaranteed to remove these nasties before they come out of your tap. The evidence is clear. The advice is simple: Stop chlorinating your body! However, to be fully informed there is more you need to know about what's in your water right now..
"The Health Problem no-one is telling you about!" Here is something that no-one seems to know. There are two huge problems looming - one is called 'feminisation of the male'. This simply means that more and more men are showing signs that indicate they are losing their masculinity. Here is one obvious example. The sperm count of the average male has gone down by an amazing FIFTY PERCENT in the past forty to fifty years. No wonder so many couples are finding it necessary to get medical help to start a family. Consider this: Researchers placed male fish in a wire cage. They put the cage near an outfall, where water from a treatment plant pours out. Within six months those male fish were displaying definite FEMALE characteristics. This is scary. The other problem is that there is a rising incidence around the world of a terrible condition called 'non-gender specificity'. What this means is that young male babies are being born without fully developed sexual organs. They are neither male nor female and in many cases are born sterile. "So what is causing this disastrous problem?" It is a combination of agricultural run off into our water supply catchment areas combined with general environmental pollution now so widespread as to affect every body of water on the planet! Some of the herbicides, pesticides, fertilisers, fungicides and other agriculturual chemicals can act in your body just like female hormones. These chemicals are known as Xenoestrogens, meaning they mimic natural estrogen, lock into the receptor sites in our body and trigger a 'feminisation process' that is thought responsible for the onset of early puberty among many girls these days as well as the problems just mentioned. A new class of water pollutants has been discovered only during the past six years. Pharmaceutical drugs given to people and to domestic animals - including antibotics, hormones, strong pain killers, tranquilisers, and even chemotherapy chemicals given to cancer patients - are being measured in surface water, groundwater, and in drinking water at the tap. Large quantities of drugs are excreted by humans and domestic animals, and are distributed into the environment by flushing toilets and by spreading manure and sewage sludge onto and into soil. German scientists report anywhere from 30 to 60 drugs can be measured in a typical water sample, if anyone takes the time to do proper analysis. 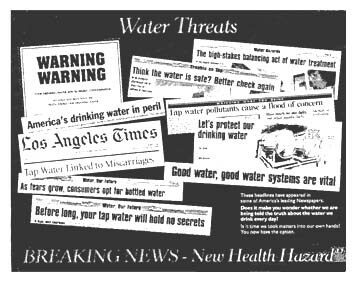 The problem is that many of these chemicals and drugs, including Prozac and Viagra, are so new that there are no guidelines published by the drinking water or testing authorities. In the words of one expert: "The authorities are overwhelmed and because there are no established guidelines, no-one is looking for these new drugs now entering the water supply. The public are being told nothing and are left to fend for themselves." The concentrations of some drugs in water are comparable to the low parts-per-billion (ppb) levels at which pesticides are typically found. To some this is reassuring, but others are asking reasonable questions; " What is the long-term effect of drinking, day after day, a diluted cocktail of pesticides, antibiotics, pain killers, tranquilisers and chemotherapy agents?" Of course no one knows the answer - it is simply beyond the capabilities of science to sort out the many chemical interactions that could occur in such a complex chemical soup. "The only solution to such a problem is prevention. Water filters are no longer optional. If you don't have one then you are only harming yourself." You don't have to spend a fortune to have quality, great tasting water straight from your tap. This is an actual photo of our new Techno Twin which we have installed, complete with a Mineraliser, to make sure that we are getting the minerals (sodium, calcium, magnesium and potassium) which our body needs. To purchase your Twin Techno Filters just click on the link to contact me for more details. I got a great deal and will be happy to negotiate for you too. Return to the Proper Hydration page from wellness-water-report.